If $100 million is a little out of your price range for a new lake-view home in Tahoe, how about the same place for 25 percent off? That’s the new asking price for Tranquility, a nine-bedroom, 38,000-square-foot mansion in Lake Tahoe, Nevada. Overlooking majestic Lake Tahoe on its own private lake, this eight-building estate was built in the late 1990s by Tommy Hilfiger Corp. co-founder Joel Horowitz and his wife. The main residence comes fully furnished with unique artifacts, furniture and artwork from around the globe. A walk through the mansion reveals a beautiful sky-lit entryway with marble floors, a large hall with 30-foot windows, and an impressive dining room with 300-year-old French plank flooring. Tranquility also features a cigar lounge that was designed like the one in New York City’s St. Regis Hotel. Along with the main residence, the 210-acre property features a conservatory, guest residence, an art studio, a boat house pavilion, a gymnasium and additional residence for guest and staff. 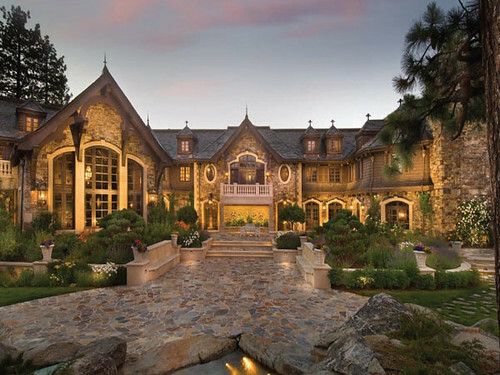 This unique Lake Tahoe mansion originally went on the market in 2006 for $100 million. The couple reduced the price this month in order to sell the home and move closer to their kids and grandkids. One lucky buyer can purchase the home for $75.